This summer I worked for an exceptionally talented pastry chef named Cam. He has worked at some of the best restaurants in the world and has uncompromising standards for bloody everything. This is not a man who gives compliments. BUT he is a man who, after you’ve done all his boring prep work (while he was outside foraging for wild sorrel or onion flowers)will show you how to make rosemary port foam, or chocolate terrines, or gellen glazed rhubarb. Which is very rare in a kitchen. So because I trailed around him all the time pestering him with questions on everything he was dubbed Papa Cam. It was his birthday on Monday and I wanted to make him a cake but Cam is so entirely not a cake person, so i figured i could go crazy elaborate (which reeked of effort) or i could go kitschy. Kitschy won out in a heart beat. Queue red velvet cake. I am a new lover of red velvet. Usually I make deep dark chocolate cakes but the hint of cocoa in a red velvet is really wonderful, and with cream cheese icing! Lordy. 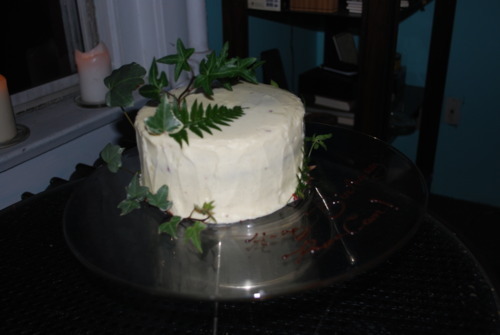 A red velvet cake should be incredibly moist not overly sweet and have a beautiful deep red colour. The red traditionally comes from undutched cocoa but now a days comes from food colouring. I don’t like mine astoundingly red, it freaks me out a little I’ll confess, but you could easily double the colouring in this recipe if you wanted. Now I don’t mean to brag but Papa Cam did say that his mom had only ever made him birthday cakes and they call came from mixes, and it definitely wasn’t the best cake he’d ever had, it was the best birthday cake any one had ever made him specifically. That’s the closest to a compliment as I’ve ever gotten from him. Sift the flour, salt and baking soda together. With the mixer on medium add in the eggs on at a time scraping between each additional. Alternate the dry and wet ingredients finishing with dry. Do not over mix. Pour into prepared pans and bake until an inserted skewer comes out with only a couple moist crumbs, about 30 minutes. On low speed add the cream cheese one piece at a time waiting until combined before adding the next piece.